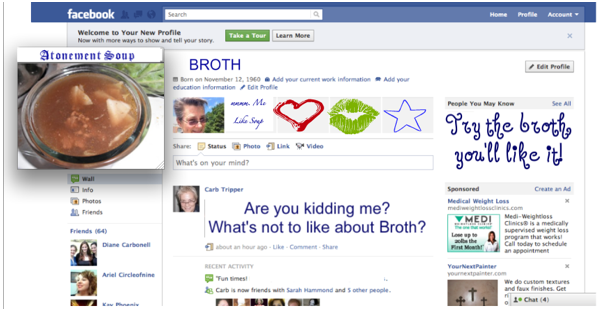 Carb Tripper: o broth, where art thou? As an homage to to Broth. I like Face Book -alot. And I click around in there alot. I put a badge on the side bar here! best efforts to avoid that at all costs! That's a problem with the Mac - if there is a problem at all. The Mac ia a learning computer - it learns you. But to do that, it places data in several different areas. clear out every fragment and remnant of deleted info. (and my mind - that too) I'm also still deleting files on the Mac. And what was that, you ask? Carbs are the topic of the day. eats more veggies than the average guy on the street. True, maybe not so much fruit. But even so, LoCarb does have a fair amount of fruit! And Low Carb is not NO Carb. I eat about 30 - 50 grams of carbs most days. was probably closer to 75 or 100 G of carbs. So I am keeping a closer eye on carbs and intake in general! How many carbs do you normally eat? Hope your day is full of people who love you back! I totally eat more VEGGIES when lower carbing (but fruit goes down). When I do higher carb, I eat more fruits and a lot of veggies, so I could easily hit 12 to 14 freggies a day. (For weight loss when I did WW, 11 freggies seemed to be the magic number to fill me up enough to leave the heavier/oilier/crappier stuff alone). I'm allowed 2 fruits now, so I feel a bit deprived, fruitwise, but I make it up by hitting the veggies hard. Breakfast easily gives me 4 to 5 servings of freggies--1/2 to 1 of fruit, the rest veggies. Anyway, I like broth, just not the salt in it. Cause I like to put stuf INSIDE of broth, hahahaha. I try to stay around 30, some days less and some more (uh yeah like yesterday)! This morning I had 2 eggs, a bit of shredded cheddar and mushroom, onion and green pepper. Then I ate some celery sticks. Veggies are not lacking for moi :-D Fruit, well I eat some berries a few days a week. Id love to have more but woe-carby! I get a healthy dose of carbs because I eat 3-5 servings of fruit on most days. I do limit the breads, rice and stuff, but the fruit is carb heavy. I like to think I am eating better carbs than before. And I shall continue to tell myself that until they invent the carb free snickers bar that looka dn tastes like the carb loaded snickers bar I wish i could eat right now. Yikes. This could turn into a competition. Silly thought, though, because we're all in this together. I hope! I've been hovering around 20 to 25g per day because I was *hoovering* too many (about 100) for a few weeks and was stalled. That got old. Well, actually, I'm still stalled. But I haven't been exercising either. Hmmmm...I think I just explained something to myself. That title is the worst pun I've heard all day. I'm definitely not low carb but i am lower carb than many :) And if i have carbs at brekkie i try not to have any at lunch etc. Generally, I am a no white flour kind of low carbie. Almost no sugar, little fruit. Whole grains, lots of veggies and protein. But I don't count my carbs. Maybe I should - I would probably be surprised that it's higher than I think. I have never counted. Thank God I do not even know how to count my carbs, actually- it would be huge! Can I friend you three more times? Broth is good stuff. Loved the Broth facebook page. It would fun to have a REAL broth page... full of recipes and puns! I'd friend you. ;-) And I am rarely even ON Facebook, LOL! Oh, and Broth should let his sister, Salad, do guest posts. You always have such scrumptious salad pics. So true, food doesn't love us back. Sometimes we just need to hear the obvious. Ahh, the home stretch, Anne. You will make it. I'm positive of that. Sometimes people think low carb, means no carb...just a moderation of carbs, right? 70 - 75 would be a holiday splurge for me! but only if you want quicker results!